When the Cross House was built in 1894 there was no television. And computers and the internet were unimaginable. Fast forward to today, and I tremendously enjoy that my big old house co-exists with a very modern world. 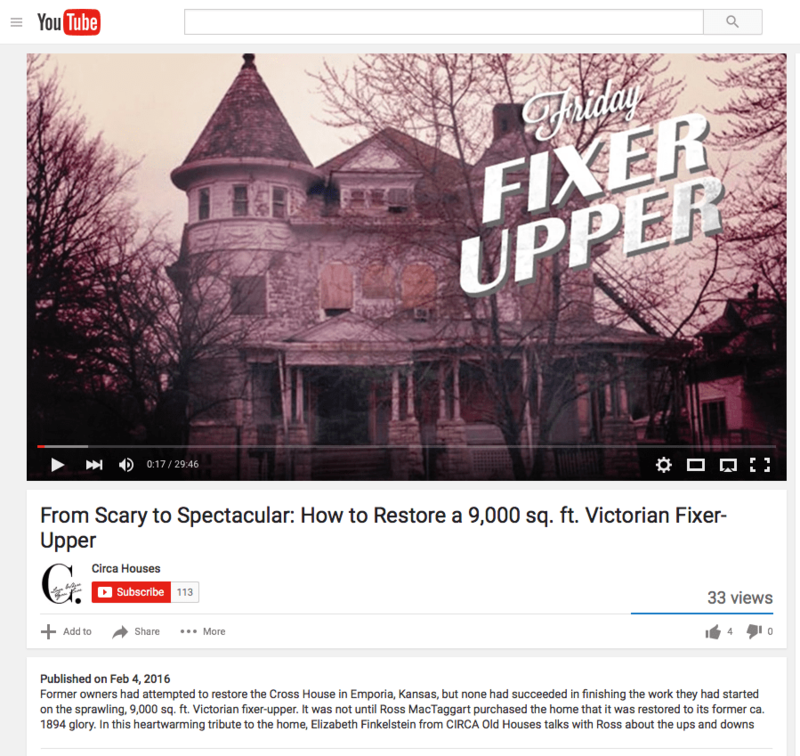 Today, a YouTube video was posted by Elizabeth, who created Circa, a delicious blog about old houses for sale. Elizabeth interviewed me a few months back, and emailed me today with the results. I clicked on the link provided, and was astonished. Listening to the interview, and watching the video, was kinda an out-of-body experience. I felt more like a viewer than participant! Which was kinda fun! It just makes me hugely smile to think that my 1894 house is now on YouTube! Wild! And you can watch here. 17 Responses to The Cross House…on YouTube? I love your home and what you are doing! I listened to you interview today and have scanned some if your blogs since “day 1″… I have always wanted to undertake a project like this but I know it will never happen…I will be able to follow your work now and dream! Thank you for being brave enough to take on saving and restoring this historic home…I am in awe of you and now will start to read all your blog posts, I think it is a good thing I am retired! Much continued success in your restoration! I can hardly wait to read ALL about it to date! Great interview! It’s nice to finally put a voice to your blog posts! Cheers! I see this more as a love story than anything else. Thank you for being such a fantastic interview subject, and being a true inspiration for old house lovers everywhere! I’m so thrilled to have gotten the chance to meet you and to hear your story. It’s been such a heartwarming experience! I am so in love with your house I get butterflies in my tummy! Thanks for sharing. I watched the video and was deeply moved as you expressed your love for fixing up this old house. When you spoke of the empty feeling in your gut you couldn’t quite place until now, that I resonate with. I so very much want to do what you’re doing and coming from a similar background of architecture, design and construction, it’s doable. Only thing is, for me it’d be about the size of an outhouse. Or maybe the carriage house! That really intrigues me. I commented on your blog about the upper floor sun porch. It could be I know why there aren’t any doors. I’ve got a lot more reading to do here and I’m loving it, loving your enthusiasm for your old beautiful house and all it’s tiny little details. The carriage house is small ONLY in comparison to the Cross House! The former has 5 bedrooms! And a formal dining room! And a huge living room! Great interview! What you’re doing is what my parents fear the most. I would forward them the video, but it would come back to haunt me. I do understand your love for the house and the thrill to see it come back. Travis! If you forward the video to your parents, they will think you are a paragon of sanity as compared to me! I came across your interview with Elizabeth while searching the Circa site and fell in love with your house. I am reading through all the blogs and look forward to each and every one of them. Thank you so much for sharing all that you are doing to bring this beauty back to its original grandeur. Ross, like Deborah I enjoyed your interview with Elizabeth Finkelstein and then binge-watched your splendid blog, now plugged into my “Favorites” index. Ross – Your comment in this video about feeling like you were waiting for something your entire life struck such a chord with me. I like what I do and I am satisfied with my life, but I feel the same. I have a greater feeling of loss when I see a dilapidated house, then most other things in this world. You are truly an inspiration to me and I hope one day to get the fulfillment you have gotten from the Cross House. Thank you for your blog and for sharing your passion with us. Finding the interview on Circa came at a great time for me. I have been working on my own old house for about a year and while it is not on the scale of your project I have felt many of the things you described. It was good to think about there being other people out there feeling some of the same things. I look forward to learning more through your blogs. I just found your blog yesterday, via the youtube post. I’ve done nothing else since, just reading the blog from the git-go. I found my way to your blog by stumbling onto this interview. It has been about five days and I started at the beginning and after a few days am also working back from the end. Your writing style brings me along for an adventure. Thanks for all you do and for sharing it with all of us. That’s how I found you!